The world has gone mad! And note this article is tongue in cheek and not meant to be taken seriously and if it offends anyone, tough! The University of Arts in Bern, Switzerland has got into the act too. Sonochemistry is mentioned and although this normally relates to acoustic cavitation in liquids, a dose of “science” is always helpful in getting the word out..... and getting funding for your otherwise somewhat useless department. Wampfler is trying Techno, choirs and Mozart amongst others and looking at the video which on the surface seems reasonable, a bit of thought brings some questions to the fore. A rack with open fronted boxes, each with it’s own big cheese and speaker has nothing but a bit of space between the boxes to attenuate one music sample from the next. And no acoustic treatment! How the cheeses are meant to discriminate anything from the resultant cacophony is anyone’s guess! Early in the video there is a passing shot of a turntable playing, if the cover also shown means anything, some offering from the Beatles. This introduces to the audiophile mind whole new can of worms. If vinyl is used as a source then does Wampfler have multiple turntables of the same make and model, not to mention the tone arms, cartridges and wires and indeed are they audiophile grade? Furthermore, ditto the amplifiers, interconnect cables, speakers and wires – I do hope they are High End! And what poor sucker gets to change tracks, turn records over and clean them. And is he using a normal record cleaner or ultrasonic to tie in with the Sonochemistry mention. Likewise are all the LP’s of similar quality new pressings or just something from the junk box? 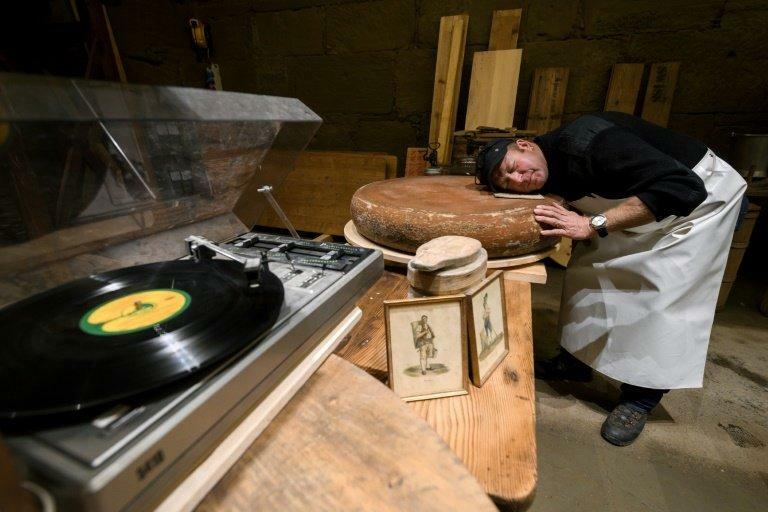 Being in a cellar, which by definition for cheese making is probably dank (definition: unpleasantly damp and cold) and by choice mouldy, what protection to the audio equipment is provided to stop the sound deteriorating? We all know mould on LP records is a big no no. Another bit of mould in the ointment is of course if the same bit of music is played over and over what effect will this have on the records themselves – they deteriorate with each playing and as mould on cheese is actually a fungus will this group of “researchers” be reported to the SPCCF (Society for the Prevention of Cruelty to Cheese Fungus). Imagine Hip Hop played over and over into your delicate ears (fungus) for months on end! And the man is a Veterinarian! The Art of the Possible or Pulling the Wool Over Your Eyes or The Emporer's New Clothes?